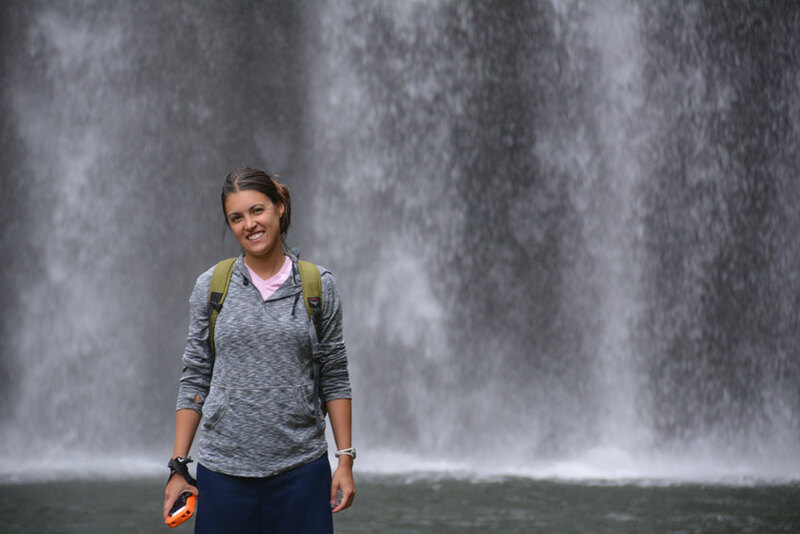 On researching our Australia road trip, we knew we wanted to check out the Tablelands, because, hey, the #1 thing to do around Cairns on TripAdvisor has to be great right? (I’m ignoring the playground that ousted it after our visit, lame.) But the question is, what is The Atherton Tablelands? It’s actually more of a large region than a single destination. 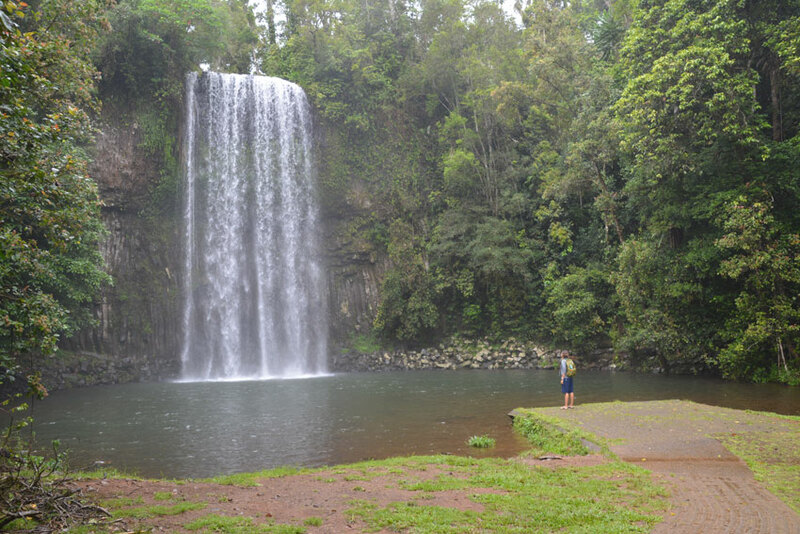 The Atherton Tablelands, just The Tablelands for short, is a plateau located 45 minutes west of the coastal city of Cairns, Australia featuring rain forests, lakes, waterfalls, dairy farms, wineries, coffee plantations, exotic birds, and even some WWII historical sites. Day two has us again rising at the crack of dawn. 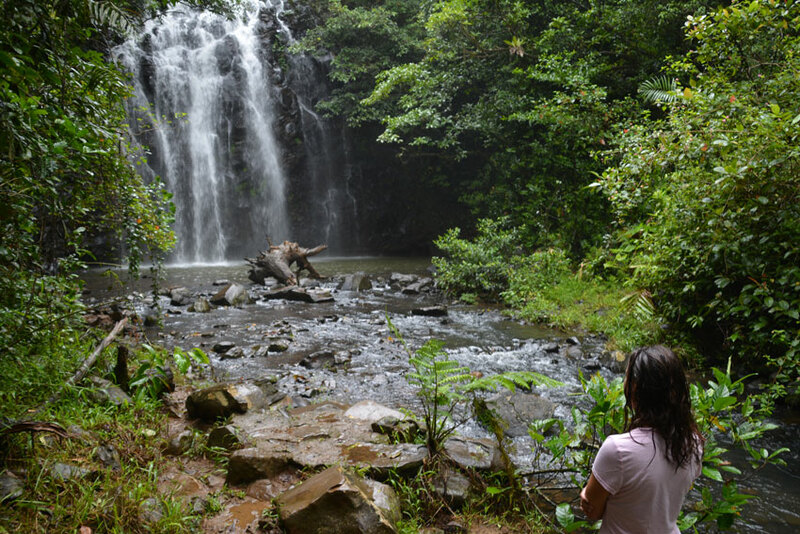 This time we are motivated by the hope of getting to the Milla Milla water falls before any tourist buses arrive. 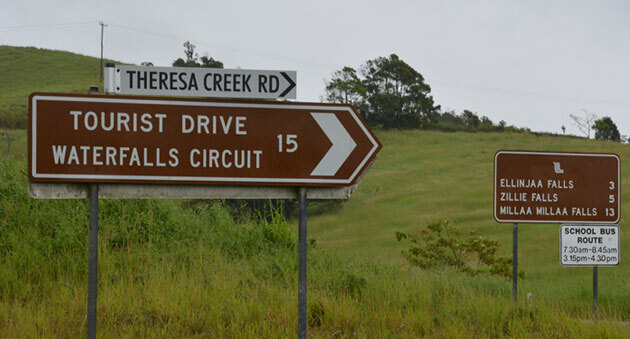 Milla Milla is one of the smaller towns on The Tablelands and is known for it’s Waterfall Drive. 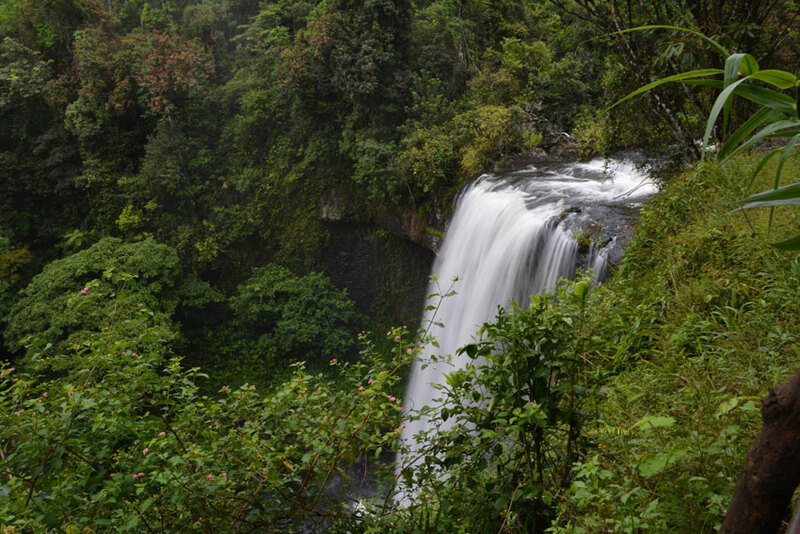 A 10-mile loop in the rainforest that features three water falls, one each couple of miles. 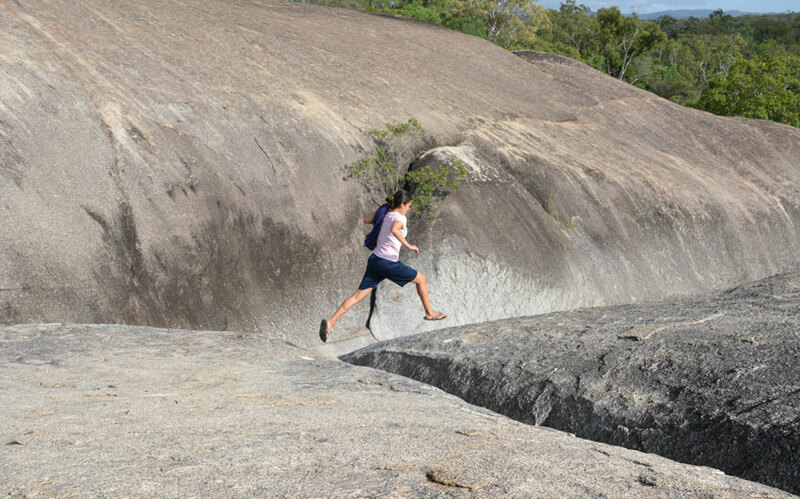 We are successful with our plan, and we arrive at the first falls, Milla Milla Falls, to an empty pool with a 40-foot monster waterfall looking down on us. Although it’s a bit chilly out (and cloudy), we’ve decided to go for a swim. The falls are so powerful, it’s actually near impossible to swim underneath them. As soon as we get close, the current pushes us away again. It is also extremely loud. 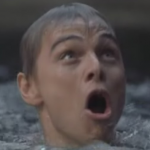 I swim up first and I cannot hear anything Alissa is saying to me back on shore. Hopefully it isn’t important. Within five minutes, she joins me in the water and after some heavy kicking, we both manage to get ourselves fully under the falls. I’m exhausted and head back to shore after about fifteen minutes in the water. Alissa spends some more time swimming, and then we’re off to waterfall number two: Zillie Falls. The third and last waterfall of the day is Ellinjaa Falls, and this one is nestled a little bit further into the woods. 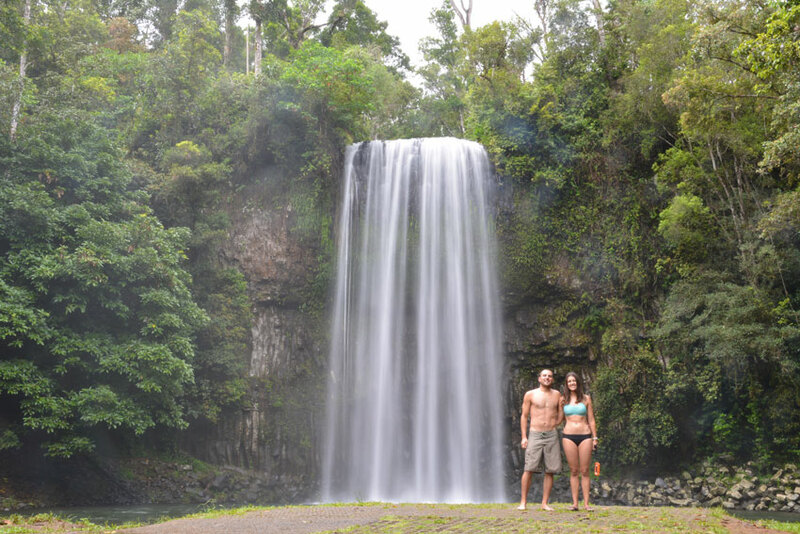 We had to trek 5 minutes or so downhill through the rain forest to get here, and for the third time we have a waterfall all to ourselves. Like Milla Milla Falls, we are again able to jump in and swim under the water fall. Ellinjaa is the smallest of the three, but easily the most accessible. It is shallow enough for us to stand underneath the falls, yet the drop is still high enough to cause pummel us with a powerful stream of cold water. It feels refreshingly nice, and we’ve spent about twice as much time at Ellinjaa than the other two. 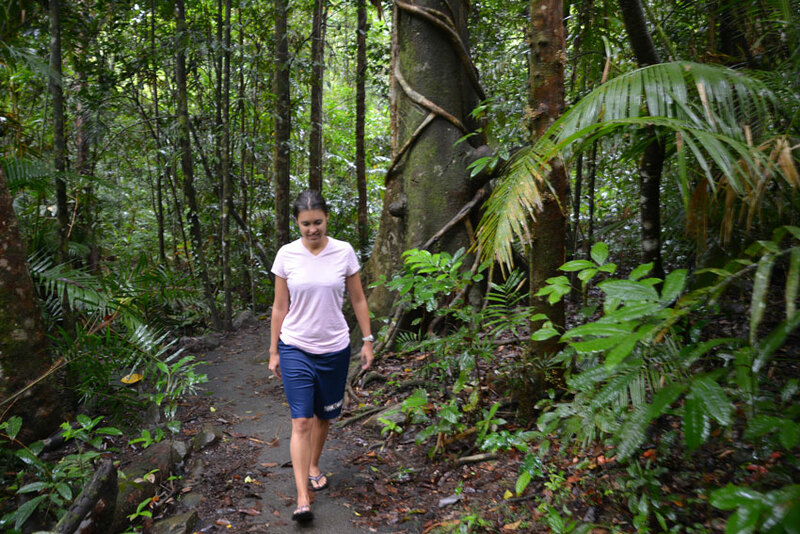 After a morning in the water, we decide to spend the afternoon walking through the rainforest in a few spots throughout the Tablelands. 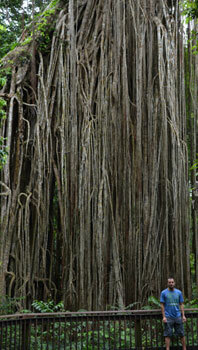 Our first stop is a boardwalk loop that takes you to a large curtain fig tree. 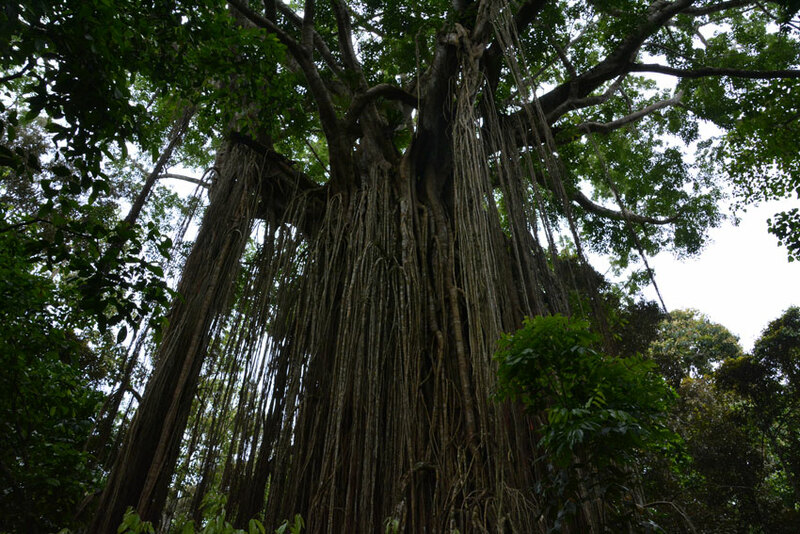 A curtain fig is a type of strangler tree that grows on top of a host tree and eventually strangling it with roots and killing it. Which leaves a large tree held up by only roots extending down, almost like a giant spider with hundreds of legs. 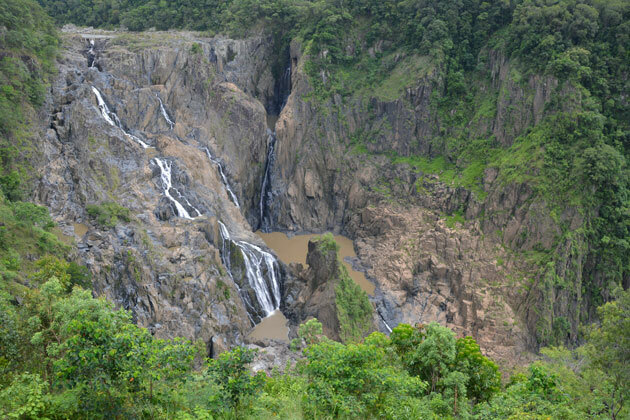 Our next stop is Barron Falls, which is another waterfall, but one that is to large to get near and features a 15-minute trek on a raised rainforest boardwalk to a viewing platform overlooking the falls. Barron Falls is the largest waterfall in the Tablelands, and it’s also the most touristy location we’ve found this week, mostly because its a stopping point of bus tours from Cairns. 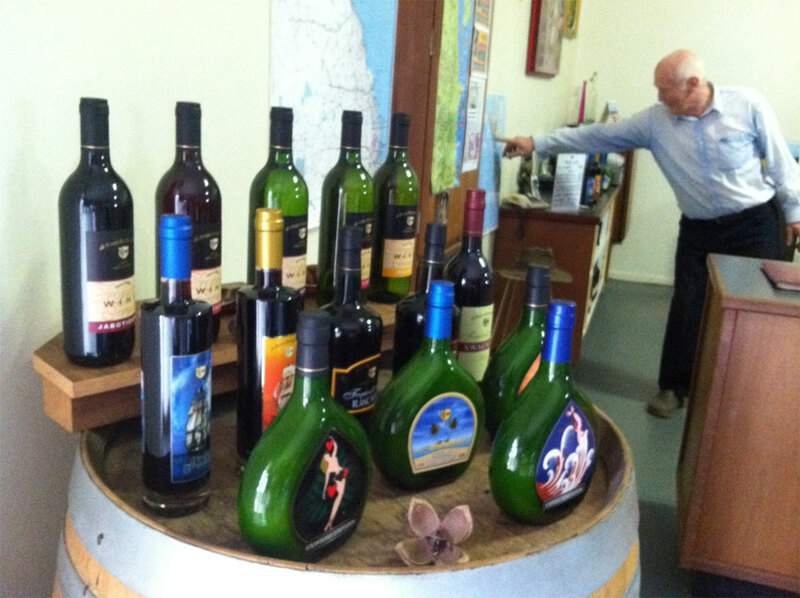 Our last stop of the day brings us to the de Brueys Boutique Winery in Mareeba, Australia. We arrive an hour before they close, and we seem to be the only visitors they’ve had in a few days. The owner of the winery charges us four dollars and gives us each a small wine glass. He let’s us try every single product they make! I have to stop with a few product left, otherwise I won’t be able to drive our campervan away from here. Alissa reluctantly continues tasting the wines and spirits (<—sarcasm). 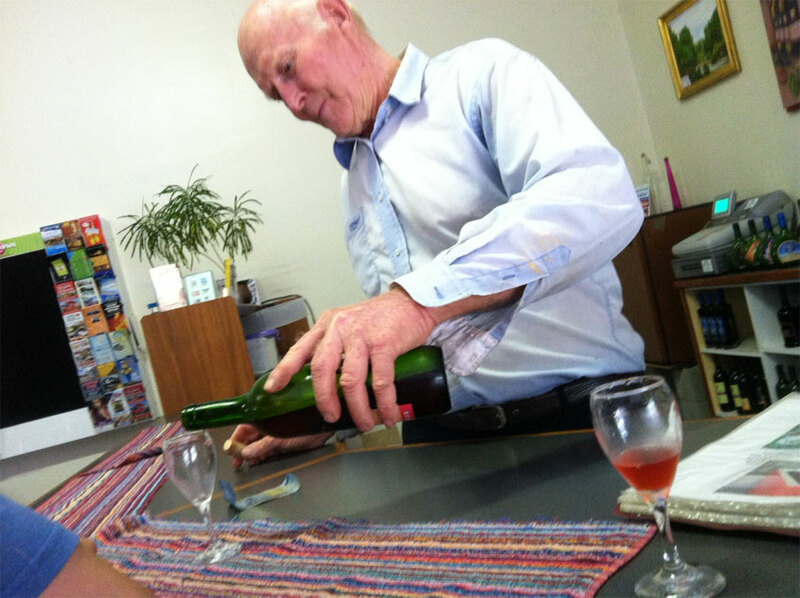 The wines are all made from local fruits that are grown in the Tablelands, and they are all very good. The owner, Bob de Brueys, explains to us the tedious, 3-4 year long, trial and error process of trying to create wines from local fruits, especially the fruits that are not popular to make wine from. For example, they make a Bush Cherry Wine, a fruit that grows in only a few places in the world, and needs to be used within two days of being picked. All the wine was great, and we purchase a bottle of our favorite for later, the passionfruit white wine. If you’re headed to Cairns, we highly recommend spending a day, preferably two, exploring the Tablelands. It is a vast, uncrowded area with so much to see and explore. Cairns is great, but it’s full of tourists and big-budget tours, whereas almost everything in the Tablelands is either free or very cheap.